When you hear from your doctor that you have seborrheic dermatitis you immediately want to ask him: “Can seborrheic dermatitis cause hair loss? Is this hair loss reversible?” And the answer to the first question will be unfavourable. But don’t be too upset; this disease is relatively easy to treat and there are many methods of hair loss treatment which lead to complete hair loss recovery. Substantial and timely therapy is an excellent solution of your problems causing in the end complete hair regrowth. Don’t wait too long – consult a specialist and find out how to stop hair loss from seborrheic dermatitis. carries a risk of infection. The scales peel off and can be observed in your hair and on your clothing. 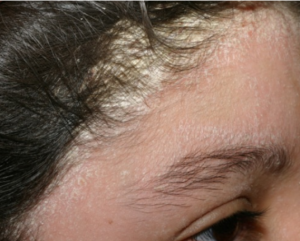 The precursor of seborrheic dermatitis is dandruff. That is why if you have this cosmetic problem, and you cannot solve it by therapeutic methods, consult a doctor as dandruff may indicate increased activity of Pityrosporum Ovale. Don’t forget to ask your. Doctor: “Does seborrheic dermatitis cause hair loss?” The answer will give you a good impetus to start treatment as soon as possible. Further symptoms are redness, as well as gradual formation of seborrheic plaques, which become bigger. The disease is also accompanied by increased hair loss from seborrheic dermatitis which stops only after you get rid of the problem. The good news is, if you have lost some of your hair due to this disease, after the treatment you can count on the full restoration of your hair without any hair transplant procedures.